The folks at Other Cinema are at it again. These are the same people that brought us Animal Charm Golden Digest last year. Now they’ve come back scratching at the door and wanting to be let in with Not 4 Sale: TV Sheriff and the Trail Buddies. If it’s possible, this collection of video editing madness might be even more frenetic than Animal Charm was. My advice to The Trail Buddies is cut back on the coffee and step away from the video editing equipment... you guys are going to hurt yourselves. ... On second thought, belay that order. Mocking commercial TV is a tough, dirty job and I’m glad somebody is doing it. 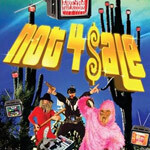 Not 4 Sale comes at the world of pop culture, mass marketing, and general mind decay that is American television in roughly the same insane way that Animal Charm did. According to the notes, TV Sheriff and the Trail Buddies are actually a performance-art band. They are guerrilla theater with an anti-corporate didactic bent. The group consists of the manic TV Sheriff, dressed in black and masked like the Lone Ranger, his sidekick the Video Ape, a guy dressed in a pink gorilla suit, and Prospector Channel 49er who is somewhat ape-like in the way grizzled old Republic Western prospectors can be when they are only wearing their union-suits. The group is seemingly plucked from a 1950’s afternoon kids show, but then dipped in a vat of LSD along the way. Not 4 Sale isn’t a film so much as a string of riffs; a grab bag of video mash-ups and a relentless agitation of the video senses. Some bits work better than others and there are moments of unintentional tedium. On the other hand there are moments of indented tedium — that is, if you can call any movie with this high velocity madness ‘tedious’. Ordinary video clips (and some video of regular commercial films) go into their blender and come out a fine paste. This is entertainment? Actually it’s more like education. I’m going to guess that TV Sheriff’s purpose is making the viewer see the “fine grain” of broadcast television, and they do that by taking a few frames and repeating them in a stuttering fashion. There is a similarity to audio sampling and a DJ’s manually playing a record to make a new sound from the old source. In a weird way, I was put in mind of H.P. Lovecraft’s favorite turn of phrase “idiot elder gods,” with the emphasis on “idiot.” There Lovecraft presents gigantic beings beyond our power to resist, but who are none the less mindless. TV Sheriff takes the idiocy of television and turns it pointedly on itself, usually by looping a clip into babbling gibberish and thereby stripping it of its original content but leaving the general mind-numbing effect. If I have one complaint about Not 4 Sale, it’s that it is all done at the same teeth-chattering tempo. Seen individually, each video routine is pretty solid, but seen as a long string it starts to have the droning sameness as bluegrass music, or for that matter, rap. Devo member Gerald Casale makes the comparison in the liner notes, saying that Not 4 Sale is a “brainwashing bumper.” (A bumper, in TV parlance, is the bit of filler that goes between two segments of broadcast video content.) This is a valid comment, particularly the notion of it being a “bumper,” or in this case 47 of them. As this DVD (or as Casale puts it “this LSDVD”) is all bumpers, all the time, so some of the zip is lost. If I have one question for the TV Sheriff crew: it’s “who in their audience possibly remembers... or even has any knowledge of... a real TV sheriff?” This is the same question I have for the people behind The Simpsons in regards to Krusty the Clown. How long has it been since there were afternoon kid shows with clowns and/or TV sheriffs? And how long has it been since broadcast TV amounted to a hill of beans? It’s been a while. Which is not to say that cable or internet video isn’t as stupid and evil as broadcast TV. It’s just evil in subtly different ways. What I’d like t see is for TV Sheriff to turn their gaze upon video-game culture or YouTube. Now there is a shambling idiot god that Lovecraft would appreciate. You can, as I did, watch this all the way through. But as noted above, it soon wears thin. Taken in small doses, it’s a hoot, li’l pardner.